Another In The Series Of Cooking With Wine Recipes. Clams and Wine, What Could Be Better? Your guests will love this dish in our series of "cooking with wine recipes". If you love clams, and most of us do, here is a quick and delicious dish that is sure to impress. Clean clams with a brush in running water. In a large sauce pan, large enough to hold the clams, melt the butter. Add the chopped garlic and shallots and cook stirring until lightly softened. To this add the bouquet garni, wine, salt and pepper. Bring to a boil and let simmer for about two minutes. Add clams and let them cook until they open. 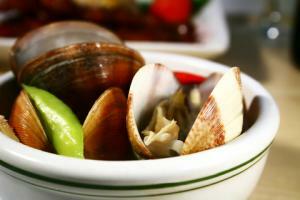 When clams have opened, remove them to a platter and keep warm. Continue to cook the liquid until it reduces by half. Remove the bouquet garni and add the clams. Cook just until clams are reheated. Add chopped parsley. Place them in a serving platter and serve immediately. You can accompany this dish with a salad and sourdough bread. Pair with your favorite Chardonnay. We Hope You Will Love This Dish As Much As We Do. Enjoy!